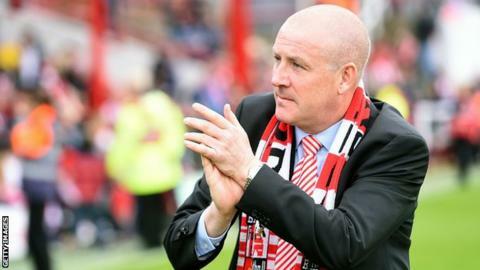 Former Brentford boss Mark Warburton has confirmed that he has held talks about the manager's job at Rangers, one of a number of clubs he has spoken to. "We've had an informal meeting," the 52-year-old told BBC Scotland. "It's important to see if there's a chemistry, the parties get on and your football philosophies are aligned." Warburton and assistant David Weir, the former Rangers captain, are believed to be on a list of possible candidates along with current boss Stuart McCall. The former Enfield and Boreham Wood defender said he was "flattered" to be considered, given "the history of the club and the global fan base". "Any job that myself and Davie Weir would look at would be about going in, having a project and being able to add value," he said. "But I'm sure a club like Rangers has got a big search process under way. "I'd like to think we have shown the attributes required to do a good job at a football club. "Whoever comes in must appreciate the size of the task in terms of the history of the club and where they have to be. "This is not just about steadying; this is about making significant progress in a designated period of time." The Ibrox side will be in the Scottish Championship next season after losing the Premiership play-off final against Motherwell. McCall's side lost 6-1 over two legs against his former club, allowing the Fir Park outfit to preserve their Premiership status. The 50-year-old former Rangers player returned to Ibrox as manager in March, taking over from Kenny McDowall, and guided the side through the play-off quarter-final and semi-final after they finished third in the Championship. He has stated his desire to stay in the job. Warburton joined Brentford as first-team coach in 2011 and took over as manager following Uwe Rosler's departure in late 2013. He was joined a week after his appointment by Weir. Promotion from League One to the Championship followed at the end of season 2013-14. However, the Bees announced in February that Warburton would depart at the end of the season. Dutchman Marinus Dijkhuizen was appointed Brentford's new head coach on Monday.